New Delhi: The first four of the 15 Chinook CH-47F (I) heavy lift helicopters ordered by the Indian Air Force from the US, in 2015, have arrived in India. The helicopters, which were handed over to the IAF earlier this month in Philadelphia, arrived at the Mundra port in Gujarat Sunday. Announcing the arrival of the helicopters, Boeing in a statement said the CH-47F (I) Chinooks will be ferried to Chandigarh, where they will be formally inducted into the IAF later this year. Sources said that the helicopter will be assembled and then flown to the Chandigarh base of the Air Force where it will become part of the 126 Helicopter Flight, a unit that operates the last of the Mi-26 choppers. The acquisition of Chinook is yet another shot in the arm for the IAF. It is a multi-role, vertical-lift platform, which is used for the transport of troops, artillery, equipment and fuel. It is also used for humanitarian and disaster-relief operations, in missions such as transportation of relief supplies and mass evacuation of refugees. The Chinooks have the capability to airlift the M777 lightweight howitzers that the Indian Army is inducting. The first regiment of the artillery guns would be operationalised by the middle of this year. This means that these artillery guns can be taken from one position to another using the helicopter, even if it is inhospitable terrain. The army plans to deploy the majority of M777s along the northern borders facing China. India had signed a nearly $3 billion deal for 22 Apache and 15 Chinook choppers with American aviation giant Boeing and the US government in September 2015. The contract has a clause to place follow-on orders for 11 more Apaches and seven extra Chinooks. While the Chinook helicopter deal is a direct one with the US firm, the one for Apache is a hybrid. A part of the Apache deal was signed with Boeing for the helicopter and the other with the US government, under foreign military sales route, for its weapons, radars and electronic warfare suites. Boeing has said that Indian industry partners such as Dynamatics are building large sections of Chinook, and the Tata Boeing joint venture in Hyderabad is building the complete fuselage of the Apache. This copy has been updated to correct the earlier headline that said heavy life helicopter. 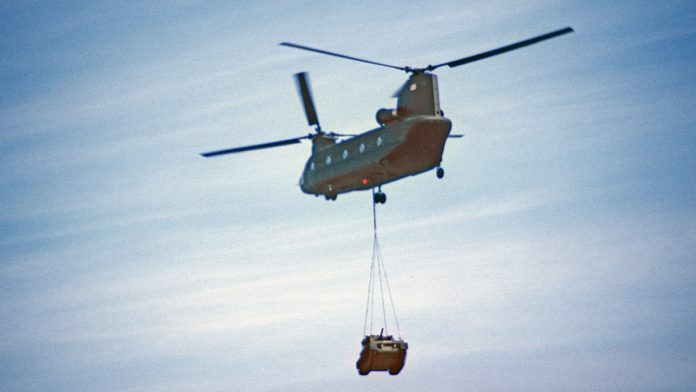 The Chinook CH-47F (I) is a heavy lift chopper. Boeing’s statement has also been incorporated.